FOND DU LAC - NATURALLY! Arrive at the Ice Age Visitor Center in Cambellsport where you'll tour the center and view a video on the ice age and formation of the Kettle Moraine. A DNR Naturalist will then step-on to guide your tour north along the Kettle Moraine Scenic Drive with stops at Dundee Mountain, Parnell Trail and Greenbush Kettle. Arrive at the Butternut Café in New Wade House Visitor Center and Wesley W. Jung Carriage Museum for lunch. Home to Wisconsin's most extensive and diverse collection of carriages, sleighs and wagons, the museum contains 70 horse- and hand-drawn vehicles. Constructed in a time before assembly lines, these carriages exemplify the craftsmanship of an earlier era. All vehicles in the collection were in operation between 1870 and 1915. Depart for Fond du Lac and arrive at the Gottfried Prairie and Arboretum. With 40 acres of native prairie, the diversity and scale of the project has attracted many species of birds and small mammals, as well as many species of flora and fauna. An informational kiosk at the main shelter will assist with a self-tour or you may arrange for a volunteer to give an overview of this project. Make a refreshing stop at Fond du Lac's A & W - providing tradition to locals for over 84 years. It's the ultimate in drive-in experience, where you may pre-arrange for frosty mugs of root beer to be served on your coach. Travel to Roosevelt Park - on a windy day you can catch many windsurfers enjoying the sun and waves on Lake Winnebago. Dine on the shores of Lake Winnebago at Sunset on the Water Grill & Bar, where the scenic views never fail to impress! Specializing in steaks, seafood, pasta, pizza and sandwiches, Sunset is the perfect spot for lakeside photos! Drive through picturesque Lakeside Park and make a stop at the Lighthouse for a group photo with the sunset on Lake Winnebago as your backdrop. If you're feeling adventurous, climb to the top of the lighthouse for spectacular views of the lake. Arrive at your hotel for some much deserved rest and relaxation. We're glad to assist researching rates and availability. Enjoy breakfast at your hotel before departing for Horicon Marsh Boat Tour in Horicon. 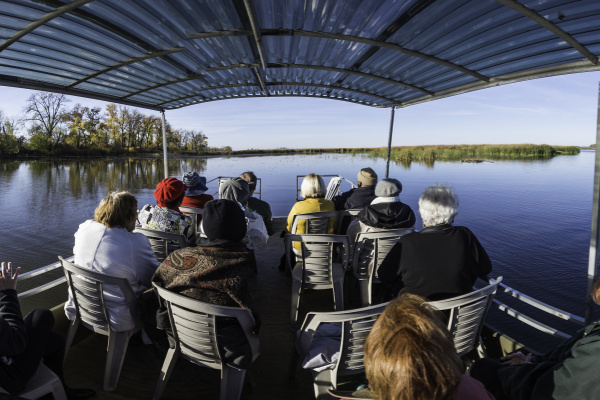 Explore the Marsh with a variety of tours including a 1½ hour Sightseeing Tour or a 2 hour Birding Adventure Tour. Arrive for a delicious lunch at a local restaurant - we're glad to offer suggestions! Depart for Horicon Marsh Education & Visitor Center where you may tour the Explorium to experience life at Horicon Marsh thousands of years before European settlement and witness how the current wetland came to be. The narrator guides visitors throughout the journey as they view, listen to, touch, and even smell exhibits documenting changes to the marsh over time. Make your next stop at Kelley Country Creamery in Eden. Learn how this family farm, in business since 1861, turns farm-fresh milk into over 300 flavors of ice cream at their farmstead ice cream parlor where 22 flavors are featured daily. Good Morning America bestowed the Best Ice Cream in America distinction to Kelley Country Creamery in 2013. Does it get any better than that? Stop at your hotel to refresh before heading to dinner at one of Fond du Lac's famous supper clubs overlooking Lake Winnebago. Return to your hotel for the evening.